One way governments attempt to reduce our vulnerability to terrorist incidents is by increasing security at airports and other public facilities. The US government also works with other countries to limit the sources of support for terrorism. Terrorists often use threats to create fear among the public, to try to convince citizens that their government is powerless to prevent terrorism, and to get immediate publicity for their causes. 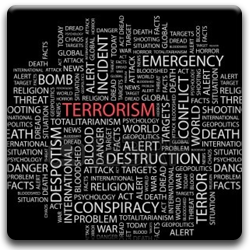 The Federal Bureau of Investigation (FBI) categorizes terrorism in the United States as one of two types–domestic terrorism or international terrorism. On February 29, 1993, a bombing in the parking garage of the World Trade Center in New York City resulted in the deaths of five people and thousands of injuries. The bomb left a crater 200 by 100 feet wide and five stories deep. The World Trade Center is the second largest building in the world and houses 100,000 workers and visitors each day. In the United States, most terrorist incidents have involved small extremist groups who use terrorism to achieve a designated objective. Local, State and Federal law enforcement officials monitor suspected terrorist groups and try to prevent or protect against a suspected attack. Additionally, the US Government works with other countries to limit the sources of support for terrorism. A terrorist attack can take several forms, depending on the technological means available to the terrorist, the nature of the political issue motivating the attack, and the points of weakness of the terrorist’s target. Bombings are the most frequently used terrorist method in the United States. Other possibilities includes an attack at transportation facilities, an attack against utilities or other public services or an incident involving chemical or biological agents. Terrorist incidents in this country have included bombings of the World Trade Center in New York City, the United States, the Capitol Building in Washington, DC and Mobil Oil corporate headquarters in New York City.